A Literary Odyssey: In the Path of Falling Objects by Andrew Smith. I decided to join a group of bloggers in reading through all of Andrew Smith's novels this summer in preparation for his new novel coming out later in the year. I had never even heard of Smith, but I am game for anything, so I joined up and downloaded the first book to Homer in anticipation. 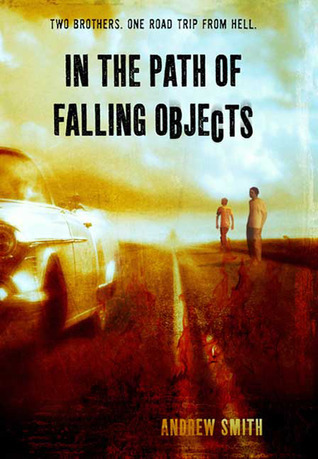 The first novel was In the Path of Falling Objects, which was originally published in 2009. After reading a bit about the story online, I figured it was a story I would usually gravitate towards-two brothers who have been pretty much abandoned by their family, a road trip, and, of course, a girl. Little did I know that the book also contained a bit of CRAZY. And that it was well-written. And that I would fall in love with it. When the book opens, Jonah and his younger brother Simon are walking away from the life they have been living. Their older brother has been away in Vietnam. Their father is in prison. And their mother left them weeks before. After the electricity was turned off, Jonah decided to leave in search of their brother, who may have deserted and come back to the States. All they have with them is a backpack with a few items of clothing, ten dollars, a gun, and a bundle of their brother's letters. The brothers are soon picked up by Mitch and Lilly, who are also leaving their lives behind. As the brothers drive further and further away with Mitch and Lilly, their relationship is truly tested...and stuff gets crazy. When I began, I really thought that this story would be about the brothers and their journey to finding their older brother. It was obvious from the beginning that Jonah and Simon had a rough relationship. They pick on each other, fight, and just generally get on each other's nerves. Simon did that annoying little sibling thing-you know, where he would bother Jonah on purpose, just to get him mad? Their relationship reminded me a lot of my own relationship with my older brothers and younger sister when we were kids. We always irritated each other on purpose. There is one point where Simon calls out Jonah on being an insufferable big sibling-always telling him what to do-and that really struck home for me. The brothers also had some obstacles to overcome. Lilly's character was definitely a turning point for the boys and how they felt towards each other. As a "hot" girl, she came between them and drove a wedge in their relationship. This is something I was unfamiliar with-the idea of siblings fighting over a love interest (mainly because my sister is 6 years younger than me and well, that would have been odd. When I started dating Matt, she was 10). I think this little conflict showed the brothers that they weren't as close as they thought, and that they must work through it. But I really did step away from the novel loving it. 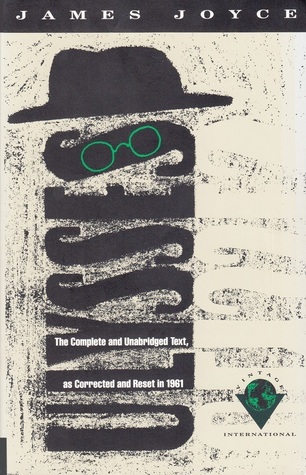 I like "issue" novels, as they are sometimes called, because they seem more real to me. I just had a conversation at work yesterday about why I like novels with ambiguous ends, with disturbing themes, or sad endings. I mean, is life ever 100% of the time perfectly happy? No. So when a novel can show real issues in a way that strikes home, I love it. The problems presented here definitely fell in that line of thinking. My one critique of the novel is this-there wasn't enough character development. Besides Jonah and his older brother (who we "meet" through his letters), I didn't feel at all connected to any of the characters. I didn't really understand Lilly and her situation (or why Jonah and Simon were attracted to her, besides the fact she was "hot"), and I think Mitch was a bit too over the top for me. I missed some of the connection to their lives. But, I still loved the novel...and ordered a hard copy of it to read again. 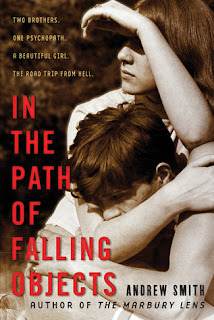 So if you're looking for a YA novel that's a bit off the beaten path, I would definitely give this one a recommendation! 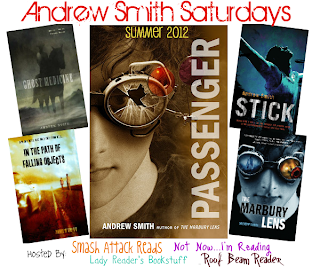 I know I am always looking for new, contemporary authors, and I can't wait to see what else Andrew Smith has in store for me this summer. 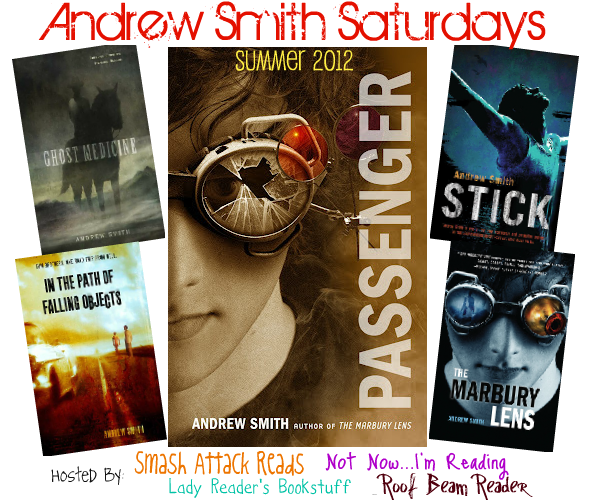 Andrew Smith Saturdays is hosted by Roof Beam Reader, Smash Attack Reads, Not Now...I'm Reading, and Lady Reader's Bookshelf. 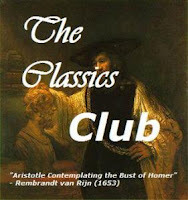 They have discussion posts up every Saturday to participate in (I am a horrible participant and didn't in any for this novel), and have books up for grabs before every readalong starts. The next novel up is Stick, which is currently on it's way to my doorstep, and all discussions will be over on Adam's blog. I hope you'll decide to join us! "Little did I know that the book also contained a bit of CRAZY." <-- Lol. Welcome to Andrew Smith! This will probably be a common theme, as you'll see. I hope you enjoy the other novels as much as this one! I love Stick (which is this month's read) - and his most popular (The Marbury Lens) is coming up later. Think this one is crazy? Just wait! Agnes Grey by Anne Bronte. The Warden Giveaway (A Victorian Celebration). The Moonstone Giveaway (A Victorian Celebration). Book 145: Catch-22 by Joseph Heller.